Joel Feldman is a colleague in the Philadelphia legal industry. 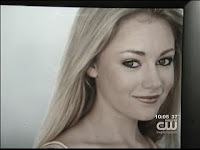 In 2009, his daughter Casey was killed in a tragic accident when a distracted driver hit her in a cross walk in Ocean City, New Jersey. Now, Joel, his family and Casey's friends are speaking out in a public service announcement (PSA) to spread the message against distracted driving. Please read this story on CBS 3, watch the PSA on YouTube. Help spread the word about how we can make our roads just a little bit safer. Big news from Google is revealed in “Google Declares War on Content Farms” by Stan Schroeder posted on Mashable.com today. Content farms are low-quality websites that pile up useless content and links in an effort to improve ranking results in Google searches. Unfortunately, a technique called Black Hat SEO is used by some to try and unscrupulously rank a website high on Google search. Google's announcement of changes will undoubtedly improve search results for all users. As of right now, there aren’t many details from Google, but we do know 11.8% of Google’s queries will be impacted. Stay tuned and happy searching! Debra Cassens Weiss of the ABA Journal tells us in her post, Solo Suspended, Partly for Implying His Law Firm Was Bigger, that a "Virginia solo practitioner has been suspended partly for holding out his law firm as a bigger operation." 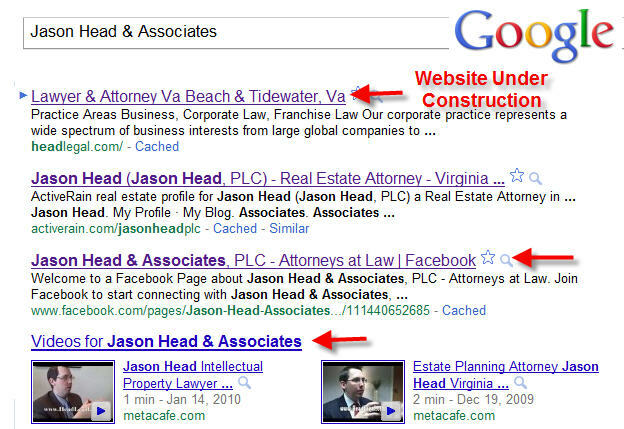 Cassen Weiss explains that, "Jason Matthew Head, a Virginia Beach [solo] lawyer, began calling his law firm Jason Head & Associates." The court mentioned that the website, letterhead, envelopes, directory listings and marketing collateral were all misleading. The opinion also indicates that Head used the words "Attorneys at Law" in the law firm name. What I find even more interesting in the opinion is the fact that this attorney was reported to the Virginia Bar for what appears to be conduct that bordered on attorney negligence. After failing to respond to a client's calls regarding the recording of a real estate deed over the course of several months (among other things), the client was blatantly aggravated to the point of no return. Cassen Weiss also explains that the court found that Head "identified nonexistent practice groups, falsely stated his firm had three locations, and implied that a nonlawyer was actually a lawyer associate." 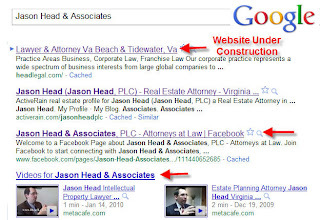 When I searched Google for Mr. Head's name, I came up with thousands of references to "Jason Head & Associates." The image above only shows the first few. It still appears on many directory listings, Facebook, video sharing sites, blogs and other places where he has worked so hard to search engine optimize the firm name and practice areas. All of this leads me to wonder if the Court would have come to the same conclusion had the extenuating circumstances not existed. As a law firm marketing and public relations practitioner, it also leaves me wondering what Mr. Head is going to do for damage control. Tuesday night, I had the pleasure of attending a "Meet the Thomson Reuters News Editors" event in New York City. A panel Q&A session was held featuring Martha Graybow, Editor in Charge of Legal, Accounting, Restructuring; Reuters News; Eric Effron, Editor, Reuters Legal News; Nadia Abadir, Managing Editor, Westlaw Business Currents; and Julie DiMauro, Commissioning Editor; Governance, Risk & Compliance Division of Thomson Reuters. The insightful program left me with a few takeaways to remember when pitching Thomson Reuters and their various platforms and publications. Each publication has a different target audience and journalistic style. There seemed to be stories that could be cross-shared between the various publications under the Thomson Reuters umbrella and the editors said they share many resources and story ideas between them. In general, they agreed that stories about legal trends and best practices of litigation would be of interest to publish. Martha spoke about Reuters News and its legal/business-based audience. She noted that the publication looks for exclusivity in their stories this is something that communications professionals may not have considered in the past when pitching Reuters and, although they are on tight deadlines, Martha added that they do compile features and special reports. As editor of Reuters Legal, a new division of Reuters, Eric Effron focuses on breaking legal news. He talked about the legal community as a whole and that he looks to publish stories on legal policy, trends and cutting-edge litigation. Westlaw Business Currents and Complinet provide cross-promotional opportunities. Each publication features guest authored articles and spotlight interviews, which are excellent ways for key experts to be quoted. Editors, Nadia and Julie, are looking for examples of thought leadership and trends in various industries including legal, accounting, compliance and financial. Above all, they discussed the importance of an article addressing “lessons learned” or how to improve efficiency from a firm management perspective or litigation standpoint. When pitching any of the editors, crafting a story idea or article with a current news hook can make it easier to cross-promote throughout the channels. Reuters News caters to the most broad-based audience while Complinet is focused on risk and financial professionals. Ultimately, answering the question, “how/why is this important?” is essential to garnering media placement within the Thomson Reuters platforms. I came across a useful article by Suzanne Vara on SocialMediaToday.com titled, Big Opportunities for Small Businesses in Facebook Pages Redesign. The article goes through the ways to utilize Facebook's recent redesign of Business Pages in a direct step-by-step way. One noteworthy change is now page administrators have the ability to respond on the wall of the company page as the brand instead of as themselves on their personal Facebook account. To learn how to adjust your Facebook settings to do so, go here. Now, it is possible to change settings so admins can also receive email notification in order to respond in a timely manner when a client/customer interacts on the page wall. There is also the ability to link your Facebook Page with Twitter. Kudos to Suzanne for highlighting the changes on Facebook pages and showing small business owners the best ways to capitalize on them. Check out her useful article to learn more! Want to know what journalists want from you and how to avoid being blacklisted? Here are the answers from members of the media. Check out my latest public relations for lawyers blog for The Legal Intelligencer. If Facebook's CEO, Mark Zuckerberg had his Facebook account hacked, don't be fooled into thinking it couldn't happen to you. The NYTimes.com blog, Gadgetwise, recently posted an informative post about how to protect your Facebook account from hackers. There is a new feature that can be activated in your Account Settings to use a new encryption option when accessing your personal account. Here's how to do it. This protection is especially useful for anyone using public WIFI when surfing the Internet.